Join us for a FREE concert of light classics on Sunday afternoon, Jan. 27, 2019 in the beautiful Landmark Center Cortile. 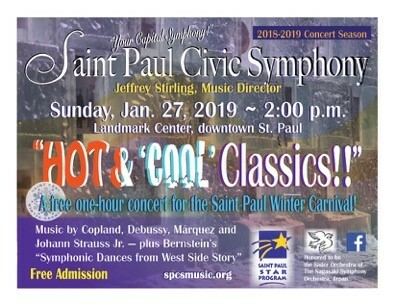 The Saint Paul Civic Symphony, in partnership with the Landmark Center and the Saint Paul Winter Carnival, presents a FREE concert of “Hot and Cool Classics” for the Saint Paul Winter Carnival. Don’t care to drive? Visit Metro Transit to plan your trip, get maps, schedules and fare information. Metro Transit is providing FREE rides to the 2019 Saint Paul Winter Carnival and Vulcan Snow Park on January 27. Just click on the icon below, fill out the form, and submit to download your FREE Metro Transit Ride Pass.